This day last year, I was dreading the upcoming weekend. Having followed a strict and intense training plan for the previous four months, I was injured and had to accept I was out of the 2013 Dublin City Marathon. This time around, I’m excited and a little anxious, but mostly really looking forward to the 2104 Dublin City Marathon. Last year I set my goal for this year to make it to the start line uninjured. I’m happy to say I have done not just that but in the intervening time, I’ve run my first marathon, and got new PBs at half marathon and 5k and met a bunch of crazy and amazing running people in Dublin Bay Running Club. I joined DBRC at the end of June, 2014. I’ve ‘run’ most of my adult life but really only started to take it seriously in the last year or two, resulting in the failed DCM attempt in 2013, and after a while out injured and then with a broken running mojo, I went into DBRC with a pretty low fitness level. • At the beginning of August, in the rain in Longwood, I got a new half marathon PB. • In the middle of September as part of the incredible EOI 10-in-10 I ran back to back half marathons, the second of which was 2 laps of howth head in 2hr4min, one lap of which had brought me to my knees just 10 weeks before. 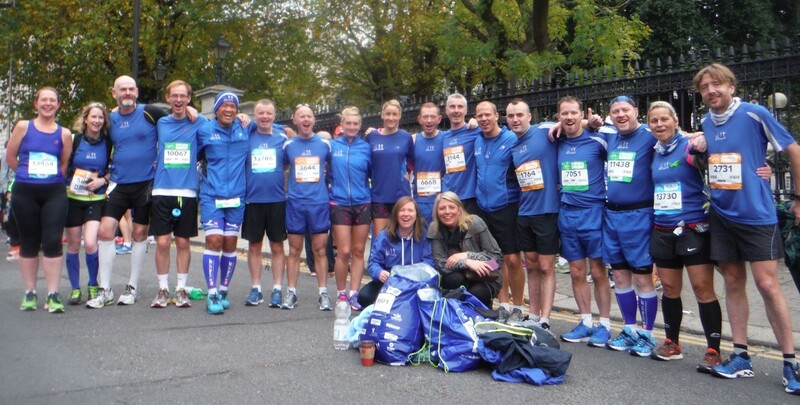 •On October 11th, I ran my first ever marathon in Lusk, Co. Dublin in a time of 4hrs13, Gary was race director that day and all the gang were there, many PBs were had and we celebrated into the wee hours afterwards. I was smiling for days! I was very lucky - the Lusk EOI Marathon could not have gone better for me. Lusk is a 4 lap course with a short out and back at the beginning. It was a cold and foggy start - perfect conditions for me! I pulled up alongside EOI RD Frank McD, at mile 2 and he stuck with me and kept me entertained all the way to the end of the third lap at mile 21. I now know Frank’s entire life story. Fueling and hydration ‘strategies’ went just fine and I just ran to feel, at a mostly comfortable pace. Except for the hills, which were not comfortable! Laps 1 and 2 flew by (in hindsight anyway) but not much talking was done on lap 3, it was tough and I could feel my legs fatiguing. Miles 22 and 23 were tough physically but I knew I was nearly there - just keep moving forward. DBRC 10in10 God Brian O’Kelly’s words rang in my ears as mile 24 ticked over - “With 5k to go just go for it - don’t leave anything out there…”. So that’s what I did. My last 1.2miles were my fastest by quite a bit and I arrived into the finish line to an incredible welcome. What a day! And now, there’s just 7 days to go til I line up at the start line for the 2014 Dublin City Marathon and I could not be prouder to wear the blue of DBRC alongside some of the most experienced and talented marathon runners in the country. Consistency - be there for every session and put in the effort. •Hills, hills, hills - I’d always avoided hills in previous training. There’s no doubt in my mind now, the contribution hills make to speed and power. •It’s just another run - don’t be overwhelmed by the ‘marathon’ label, you’ve done this many, many times before, just remember what you’ve learnt along the way. •Listen to those more experienced than you, they’ve probably learnt the hard way, they’ve been there, they know. •For me, joining DBRC was the best thing I’ve ever done for my running. If you are serious about your running and want to improve, want to meet some amazing people and laugh so much your stomach hurts, then just do it. •Ger, The Boss - goes without saying but gotta say it anyway. He’s there every day in sun, wind or rain, leading the troops and kicking them into shape. He pushed me up that hill (literally) the first day in Howth and probably will you, too. Now I do it in 57 minutes instead of 1hr20! Thanks, Boss! •Brenda, The Awesome - what an inspiration! I met this lady in my first day in the club she’s been an amazing support and source of chats/laughs ever since, while getting some 70-odd marathons under her belt this year. •Brian O’Kelly, 10in10 God - what a runner, and a more humble person you will not meet. Put in the hard work, believe in it, add a bucket load of talent and you’ve got Brian. Thank you for caring about my half marathon when you’d just won 9 out of 10 back to back marathons!